What Are the 3 Major Credit Reporting Agencies? Credit bureaus, also called credit reporting agencies (CRAs), are companies that collect and maintain consumer credit information. They then resell it to other businesses in the form of a consumer's credit report. There are three major credit agencies in the United States: Equifax, Experian, and TransUnion. There are other smaller, specialized agencies as well. When creditors and lenders check your credit, they'll very likely do so with one of the major CRAs. These three agencies retain information on more than 200 million Americans. 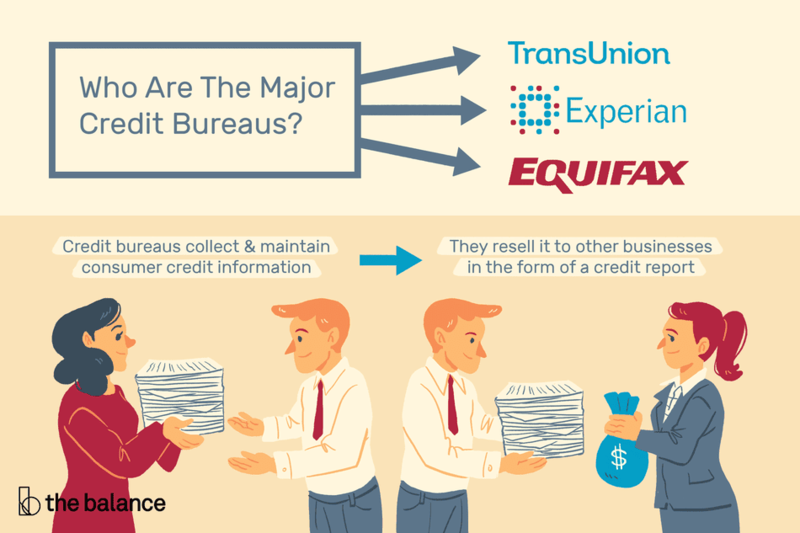 All three of the major credit bureaus are publicly-traded, for-profit companies—they're not owned by the government. The federal government has legislation—the Fair Credit Reporting Act (FCRA)—that regulates how these and other credit bureaus can and must operate. They're monitored by the Federal Trade Commission and the Office of the Comptroller of the Currency because they handle sensitive information on so many millions of citizens. The major CRAs receive credit-related information from the companies and lenders with which you do business. Lenders report to them regularly as to whether you're paying your bills on time, if you've ever been 30 or more 60 days late, or if you've ever defaulted entirely. They report how much debt you owe to them. The credit bureaus also pull relevant public records, like tax liens or bankruptcy information, from state and local courts. This information is included in your credit report as well. CRAs sell consumer credit information to businesses that have a legally valid reason for reviewing it. For example, a company with whom you've applied for credit would have a valid need to look at your credit history. Your information can also be sold to companies that want to prescreen you for their products and services. Employers and landlords typically cannot access your credit report without your written permission. Some agencies offer credit monitoring services to consumers as well, but you have to pay for it. Credit reporting agencies can only provide information and analytical tools to help businesses make decisions about whether to offer you credit and what sort of interest rate they should charge you. The bureaus themselves don't make these decisions. Equifax has been around since 1899, but its reputation was blemished in 2017 when it was hacked and suffered a data breach that divulged the critical personal information of 143 million consumers. Equifax has since made a tool available on its website where you can check to see if you were affected. The company also tried to make amends by offering a free credit monitoring service to consumers whose information was breached. Equifax offers credit fraud protection and identity theft protection to consumers, as well as selling credit reports to businesses. It offers both their FICO and VantageScore credit scores to consumers for a fee as well. Experian got its start in London when businessmen there began sharing information on customers who did not pay their bills. These businessmen formed the Manchester Guardian Society in 1827, which later evolved into Experian and reached around the world. Experian uses the FICO 8 credit score calculation system. It also offers a Credit Tracker by subscription. You'll get your credit score as well as your credit report if you subscribe. TransUnion started out as a holding company for a tank car company, then it branched out from there into credit reporting. If you're worried that you're a victim of identity theft or that you might be, you can place a freeze on your TransUnion credit report and TransUnion will take the extra step of notifying the other two CRAs that you've done so. You can also purchase a credit monitoring subscription with this agency. Credit bureaus often have business relationships with the same banks, credit card issuers, and even other businesses that you might have accounts with, but they're separate entities. Your account history will appear on one or all of your credit reports from these agencies because of their connections, but credit agencies don't share your account information with each other. Credit freezes and fraud alerts are exceptions to this rule. Your creditors might report to all three of the major CRAs or to just one or two of them, so the information on you contained in one of their files might be different from the others. When potential creditors and lenders check your credit, they might pull one agency's credit report rather than all three of them. It's usually less expensive for a business to check just one credit report. It's important that you periodically review your reports from as many of the agencies as possible to ensure that everything is correct. Some CRAs specialize in specific types of reporting so certain lenders or companies are more included to purchase reports from them than from the others. For example, some specialize in screening potential employees while others handle rental histories for landlords. PRBC/MicroBilt serves predominantly subprime lenders who are willing to extend loans to low-income individuals and those with poor credit. Innovis only provides data that will help confirm your identity for purposes of fraud prevention and detection. Financial institutions have their own reporting agencies, including TeleCheck and ChexSystems, that focus on bank account activity such as overdrafts. Some agencies are unique to the medical or insurance industries. These specialized agencies might not gather all information concerning your credit history, but rather only the information that's pertinent to their particular scope. You have a right to view your credit reports and you're entitled to receive a free report from each of the major credit reporting agencies once a year. Visit AnnualCreditReport.com to make the request, or call 877-322-8228. You can also get a copy of your report at no charge if you've been turned down for credit, but you have to make the request within 60 days of being declined. You can purchase additional credit reports directly from any of the CRAs at any time if you want to check where you stand more than once a year. Even though they're separate entities, two of the major agencies—Equifax and Experian—offer credit reports which include some information from the three major credit reporting agencies in a single document. You must purchase your credit score separately from your credit report. Your score is derived from the information in your credit report. You might want to contact a credit agency directly to dispute inaccurate information you've found in your report. CBS reported in 2013 that approximately 40 million consumers found errors on their reports, and about 20 million of these people felt that the mistakes were pretty serious. It's a good idea to contact the lender or company who submitted the inaccurate information as well. Do it in writing and keep copies of all correspondence. You can reach out to Equifax on its website, by calling 800-685-1111, or by mail at P.O. Box 105788, Atlanta, GA 30348-5788. Contact Experian at its website or in writing at P.O. Box 9554, Allen, TX 75013, or call 888-EXPERIAN (397-3742). TransUnion can be reached at P.O. Box 2000, Chester, PA 19016, or by calling 800-909-8872. And, of course, you can always visit the CRA's website. You can also reach out to any of the credit reporting agencies to place a fraud alert or credit freeze on your credit report if you have reason to believe that you're a victim of identity theft. A credit freeze blocks access to your report, so you won't want to apply for credit if you've put one in place. The lender won't be able to access your report. This service is often free, and you can lift the freeze at any time. You do take steps to lift it when you want businesses to be able to access your report again. Otherwise, it will remain in place forever. Placing a fraud alert works in much the same way, but it only stays in effect for 90 days. An alert is always free, but you might have to pay to place a credit freeze in some states. It's a good idea to freeze your account with all three major credit bureaus if you think there's a problem. The Fair Isaac Corporation (FICO) is another major company in the credit industry. FICO developed and maintains the FICO credit score, but it is not a credit agency. Although FICO compiles credit scores based on data from the major credit bureaus, it does not collect credit report data on its own.